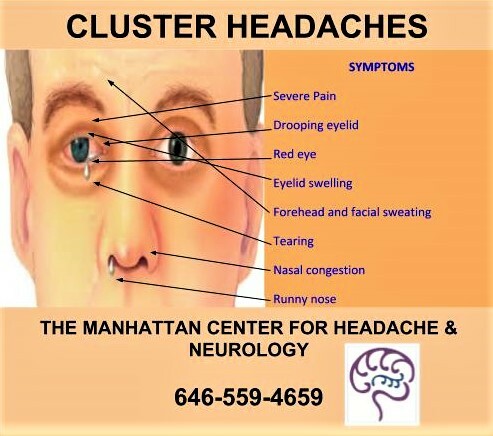 The term cluster headache comes from the recurrence of headache attacks usually in a series (cluster periods) lasting for weeks or months, separated by remission periods (periods of headache freedom) usually lasting months or years. Cluster headaches are often said to be the most painful of all headaches. They have been described as “boring,” “bearing,” “burning,” “like a hot poker in the eye,” and as “suicide headaches.” The age of onset of cluster headache is most often between 20 and 40, and they are more common in men than women at a ratio of 3:1.
flushing or sweating of the face or a sense of restlessness and agitation. Trigeminal refers to cranial nerve 5, which is the nerve that controls sensation of the face. For this reason, the pain associated with cluster headache often localizes to the face particularly around and behind the eye. Autonomic refers to symptoms like red or teary eye, runny or stuffy nose, sweating or flushing of the face, drooping of the eyelid, or sense of fullness in the ear. In cluster headache, these symptoms occur on the same side as the pain. Cluster headaches are attacks of severe pain lasting 15-180 minutes and occurring from once every other day up to eight times in one day—averaging 2 per day over typically 4-6 weeks then entirely disappearing for 6-12 months. There are no diagnostic tests to confirm cluster headache. 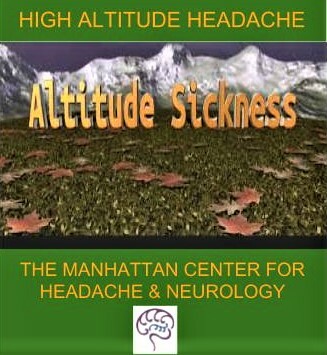 Diagnosis is accomplished by reviewing personal and family medical history, considering associated symptoms, and an examination. .
A headache is the most common symptom that one experiences usually over 3000 meters above sea level. Other common complaints are loss of appetite, nausea and sleep disturbances. The headache must develop within 24 hours after ascent and resolves within eight hours of descent. A HAH can be prevented by a slower ascent, usually 300 meters per day, allowing 2 days to become acclimated before engaging in strenuous exercise at high altitudes, avoiding alcohol, and increasing hydration. Over the counter medications such as paracetamol or ibuprofen have proven to be effective in treating HAH. Triptans are also effective. Acetazolamide may reduce susceptibility to acute high altitude sickness. If you are experiencing a HAH that has not gone away, please schedule an appointment to see one of our providers at MCHN. 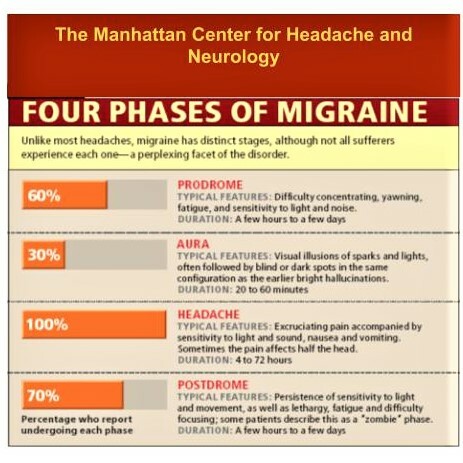 Which migraine phase are you in? E. Not attributed to another disorder. History and physical examination do not show signs of gastrointestinal disease. Migraine medications can sometimes help stop or even prevent cyclic vomiting episodes. These meds may be recommended for patients with frequent and long lasting symptoms and even patients with family history of migraines. Treatment usually focuses on controlling the signs and symptoms. Prescriptions may include: anti-nausea medications, pain-relieving medications, anti-reflux medications, antidepressants and anti-seizure medications. IV fluids are often necessary to prevent dehydration. Treatment is individualized based on severity, duration or presence of complications. 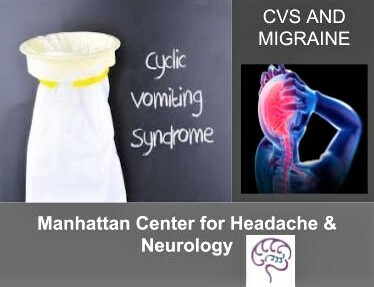 If you are experiencing CVS with no evidence of gastrointestinal disease, you may be having migraines, which require treatment by a headache specialist. At MCHN, we provide IV hydration and medications to treat CVS. Stress and tension can cause the muscles of your neck and back to become tight and form knots. The pain from this tightness can radiate to your scalp and head which may develop into a migraine. The migraine is the result of stress induced tension. 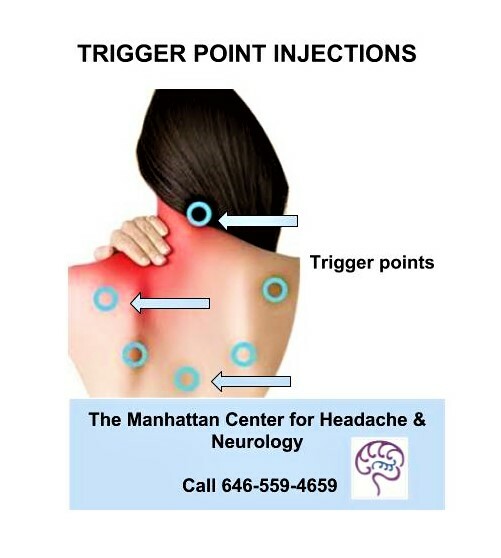 Trigger point injections may be able to relieve your stress induced migraines. Injections of lidocaine are administered into the trigger points of the back and neck. This helps address the pain sensation and give your muscles a chance to calm down by inactivating pain receptors. Discuss therapy with one of our caring providers. A specialized treatment plan will be developed just for you. Treatment may consist of a combination of therapies. Post-traumatic headache (PTH) is a headache that develops within 7 days after injury or after regaining consciousness. The cause of PTH could be related to the release of certain chemicals, the swelling of important brain structure or even brain shrinkage. More severe injuries require a CT or MRI scan to rule out a brain bleed. Patients that have head injury may find it hard to perform daily activities, miss school, miss work and in general experience a lower quality of life. Treatment for PTH includes: medications (anti-inflammatories, pain medicines and triptans) used during the weeks of initial treatment. When the headaches persist, preventative medicine should be considered like: antidepressants, blood pressure pills, and anti-seizure medicines. Non drug therapies are also effective: physical therapy, biofeedback/relaxation therapy, nerve stimulators and cognitive behavioral therapies. 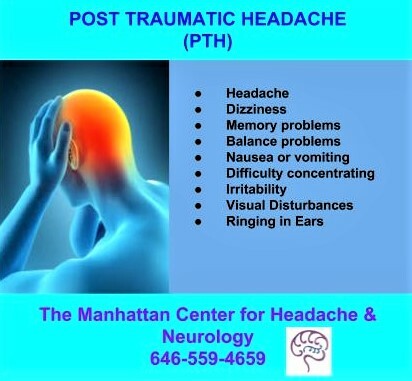 Please contact The Manhattan Center for Headache and Neurology to learn more about PTH and treatments. We look forward to hearing from you! Why are my headaches now daily? There are several risk factors that put the headache patient at risk for exacerbation. Many of these risk factors are modifiable and some are not such as genetic predisposition. Medication overuse – primarily combination analgesics combined with caffeine (over-the-counter or prescription), Caffeine, Ergotamine, Opiates, Over-the counter or prescribed analgesics, and Triptans. All these medications can be effective in treating episodic headache when used on an occasional basis. However, when used more than two days a week, they may transform and aggravate headache. Stress – Stress is the most common trigger for headache in headache sufferers. Frequent life changes and chronic daily stressors or “hassles” can lead to the development of chronic headaches. These stressors may also result in anxiety and depression. Sleep disturbance – Chronic inadequate sleep of approximately 6 hours or less per night creates risk for more headaches. Most common sleep problem for headache patients is insomnia (trouble falling asleep, staying asleep, or poor quality sleep). Caffeine – Caffeine can aggravate headaches the same way medication overuse can. Frequent use of caffeine can also be a risk factor for headache progression. Caffeine is added to certain pain medications because it can be beneficial for migraine when used occasionally and in moderation, defined ideally as two days per week or less. An understanding of the specific causes or contributing factors that lead to progression, and then reversing them, is key to successful treatment. 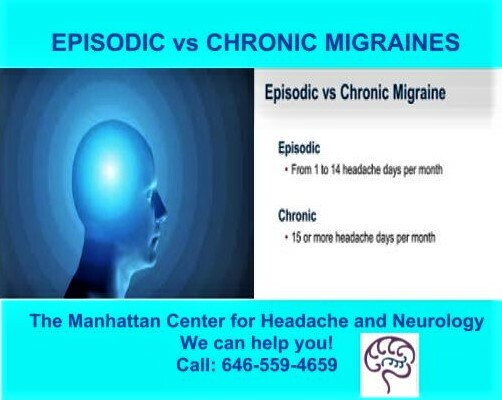 Please call us for a consultation if your headaches have transformed from episodic to daily. Migraine patients are encouraged to do regular aerobic exercise to reduce frequency and intensity of migraine. Unfortunately, exercise can be a trigger in 22% of patients with migraine leading to a more sedentary lifestyle and an increase in migraine. Yoga is a form of exercise that combines slow, intentional movements with breathing techniques and meditation. The benefits from yoga include flexibility, muscle strengthening and both physical and mental benefits. Besides as an exercise, there are other benefits of yoga including a reduction of stress that then leads to better sleep, which is extremely important in warding off migraines. Relaxation calms the sympathetic nervous systems (the part of the body that says fight or flight) reducing chemicals that may increase the chances of migraine. So go grab a mat and get your yoga practice started! Kisan R, Sujan M, Adoor M, et al. Effect of Yoga on migraine: A comprehensive study using clinical profile and cardiac autonomic functions. Int J Yoga. 2014;7(2):126-32.
work with your doctor to learn how to come off certain medications, such as opioids or butalbital containing medications, safely. 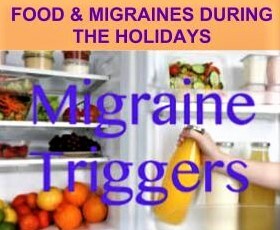 The holiday season brings friends and families together and is celebrated with food which can trigger HEADACHES and MIGRAINES. Food is a trigger for migraines and avoiding some of the triggers can cut back on the frequency of the attacks. Aged cheese and meats : The nitrites or nitrates in salami or other aged meat can cause headaches/ migraines. Aged cheese is very salty and can cause dehydration which can trigger a migraine. Chocolate: Darker chocolate tends to be more of a trigger than others. Monosodium Glutamate or MSG: Glutamate is an excitatory neurotransmitter found in Chinese food, barbecue sauce and some salad dressing that can trigger migraines. Spicy foods: Spicy food containing chili peppers which interacts with TRP receptors in the brain can trigger migraines. Diet Sodas: They contain aspartame which in turn can trigger migraines. Citrus Fruits: There are high-acid foods that can cause gastric irritation which in turn can trigger a migraine. Keep hydrated, drink plenty of water. Discuss the triggers with your neurologist or dietitian. 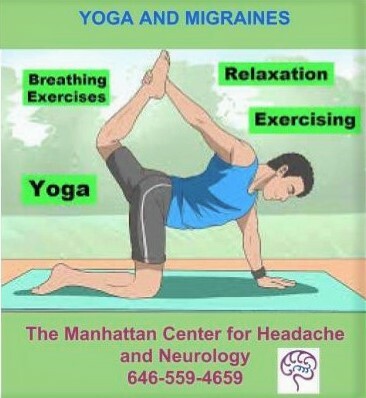 Manhattan Headache and Neurology provides Personal Headache Management services in the New York Metropolitan Area.